The 308 Winchester is one of most popular long range rounds in the world. For decades, shooters have turned to the 308 Win for range training, match shooting, and hunting applications. Accurate, reliable, and effective, the 308 Winchester is just what you need. Federal has been around since 1922 and is one of the most loved and respected ammunition manufacturers in America. 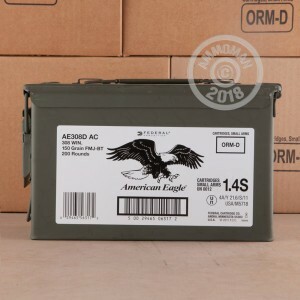 When you want something inexpensive to plink with or something incredibly effective for self defense or hunting, Federal is the way to go.The American Eagle line is a great combination of performance and affordability. 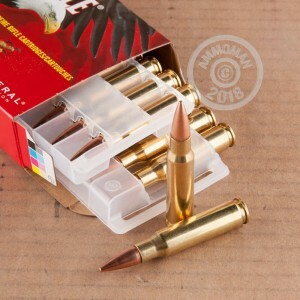 Each cartridge in this 200 round ammo can features a 150 grain, full metal jacket boat tail projectile that is loaded into a boxer primed brass casing that is re-loadable. These rounds are perfect for target shooting at the range and offer great accuracy and consistency at a competitive price. 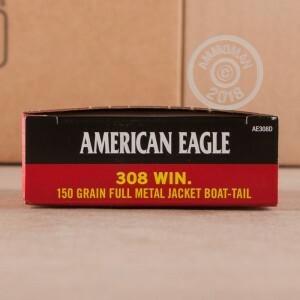 Order this American Eagle ammo can today and your order will ship for FREE!